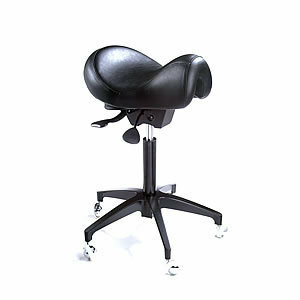 WBX Ascot Saddle Gas Lift Stool in black upholstery. In stock for immediate delivery, the ascot is the ultimate hairdressing and beauty stool. The ascot stool with the infinitely adjustable seat mechanism (locks in any desired position, as shown on ascot saddle with red/black upholstery picture) to place your stylists or beauty therapist's back in the correct posture while cutting and styling hair or doing beauty therapy. Studies have proved that saddle style seating reduces back, neck and arm discomfort, improves leg circulation. It comes with smooth running castors. There are three height options standard 21" to 27 ½", high 25" to 33", extra high 28" to 39". (Please use drop down box to select your choice).